With two weeks to go, here’s the latest projected bracket from College Sports Journal. 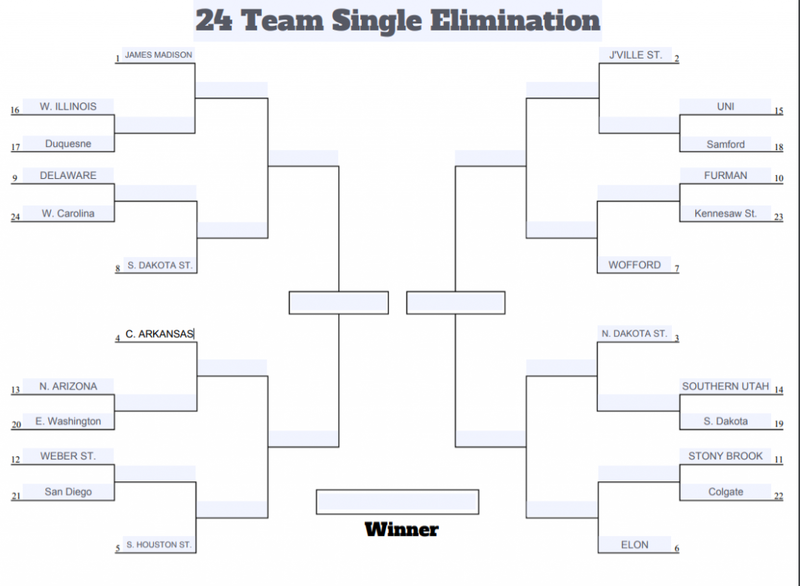 This year, we are picking a bracket based on staff picks, Sagarin Ratings, the FCS Coaches’ Poll, and some special sauce to determine who we think will be in the playoff field, who is seeded, who is in, who is out. In the FCS playoffs, there are 10 conferences that get autobids, the Big Sky, Big South, CAA, Northeast, Missouri Valley, Ohio Valley, Patriot League, Pioneer Football League, Southern, and Southland Conferences. Big Sky: We are still projecting that Southern Utah will win the Big Sky championship and autobid. Still in the running are Weber State and Northern Arizona, but if the SUU Thunderbirds beat the NAU Lumberjacks, SUU will be Big Sky Champions. Any other scenario for the title involves an NAU win on November 18th. Big South: Kennesaw State still gets that slight nod thanks to the fact that they host Monmouth at home during the last weekend of the season. The Hawks and Owls both won last week, but a tricky matchup with Charleston Southern awaits this weekend. The Bucs, Hawks and Owls are all alive in the Big South postseason race, with a 9-2 Hawks or 9-2 Owls team perhaps in consideration for an at-large bid. Colonial Athletic Association: Undefeated James Madison is the odds-on favorite to repeat as CAA champs and get the No. 1 overall seed, but the title chase and autobid might not be decided until the final weekend of the year when they face surprising 7-1 Elon. Missouri Valley: Amazingly, even with their loss to South Dakota State last week, North Dakota State is still in control of their own destiny in regards to the Missouri Valley title, thanks to an incredible run of upsets last week. If they beat South Dakota this week, and beat Illinois State next weekend – and CSJ thinks that will happen – the Bison will once again be Missouri Valley champions. Northeast: Duquesne and Central Connecticut State meet in Pittsburgh this weekend. The winner will win the NEC title and the NEC’s autobid – CSJ thinks that will be the Dukes. Ohio Valley: All Jacksonville State has to do to clinch yet another OVC championship is to win one of their last two games. Spoiler alert: they will. Patriot League: With Lehigh’s win over Bucknell last weekend, the title picture went from unintelligible to merely muddy. The fact remains that if Lehigh or Lafayette win out, one or the other will be the Patriot League champions, but the team with the most favorable schedule and record is actually Colgate. The Raiders need Lehigh to lose one more game, though, and will be watching every week to see if that happens. This week, Lafayette faces off against Colgate, and Lehigh squares off against Holy Cross. Pioneer: With San Diego‘s win over Drake this weekend, all the Toreros need to do is win one of their last two games to clinch the PFL title outright. Unless 2-7 Davidson consummates the upset of the century, San Diego should be the PFL’s representative in the playoffs. Southern: After Wofford took care of business against 2-7 Chattanooga at home. All that’s left in SoCon play is a visit to 0-10 VMI, and once that game is done, the Terriers’ SoCon co-championship will be clinched and FCS autobid will await (thanks to their head-to-head over Furman). Southland: Step One of Central Arkansas‘ avoidance of the the November Southland Curse was completed this weekend against Lamar. If they can avoid it the next two weekends at Lamar and at home vs. Abilene Christian, the outright Southland Conference championship and autobid will await. If they slip up, Sam Houston and Nicholls will have an opportunity to get a championship or co-championship. These are based off of the FCS Committee’s released seedings from last week. 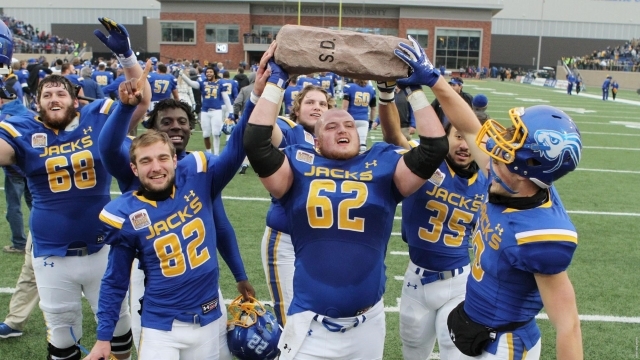 CSJ feels like South Dakota’s upset loss will knock them just out of the seeding this week, while South Dakota State will jump into the seeding conversation. North Dakota State will still be seeded, CSJ feels, but not by much.